Lee Walter Armijo, 57, a resident of Truth or Consequences, NM, Port Hueneme CA, Crystal Rivers FL, and Clovis NM, passed away peacefully on January 3, 2019 at Memorial Medical Center. Walter was born to Porfirio Armijo (Baca) and Frances (Apodaca) Armijo on April 7, 1961 and raised by mom Maria Armijo (Lopez) (Deceased). Walter is survived by his siblings: Alex, Juanita, Carmen, Mike, Salvador, Crucita, Frances, Cecelia, Maria, and Leticia; as well as numerous nieces, nephews, cousins, aunts, uncles, and friends. Passed siblings were; Brijido, Louie, and baby Porfie. Walter will be remembered for his love of drawing, hard work, strong and good heart. He was loved by all that knew him. A most kindhearted soul he was. He helped anyone that needed help. 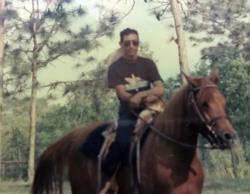 He loved horses, old cars, good music, and most of all his family. He will be greatly missed. Cremation has taken place and a Rosary will be recited by Gary Montoya on Thursday, January 10, 2019, at 6:00 PM at Kirikos Family Funeral Home with a Memorial Mass on Friday, January 11, 2019, at 11:00 AM at Our Lady of Perpetual Help Catholic Church celebrated by Rev. Don Hyatt, CSB. His remains will be laid to rest with mom, Frances, at Hot Springs Cemetery directly across from his home on Ash. All are welcome to celebrate his eternal life with us. Many thanks to his neighbors, friends and family that were there for him in times of need.